Samsung Files Patent for a Smartwatch That Scans...Veins! Without any doubt, it feels good to see Samsung hitting on uncharted territories. From what we normally see is Samsung only concentrating on smartphones but this time they are working on something radical. Swiping was one way to unlock phones, then came voice recognition and now the latest trend, fingerprint scanner. Maybe it’s time to try something different! Samsung is now flirting with the idea of a smartwatch that can recognize the person by his/her veins. Veins? Never did we think veins could come into use in the tech world. However, this seems to be plausible as the technology works quite similar to the fingerprint technology. 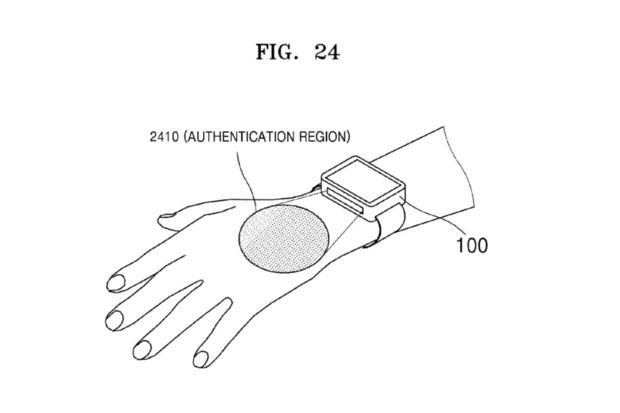 Instead of using the fingertip, the watch snaps a picture of the vein strcuture and stores it in the database. At the time of authentication, it will read back the database and see if the veins match with the person wearing the smartwatch. The patent further illustrates by showing a camera sensor and two light sources at the side of the body. The camera would be using infrared rays to scan the area where the watch will be placed and record the vein structure. As we all know, there has been huge discussions based on using fingerprints which is somewhat an invasion of privacy. Who knows where the fingerprints are saved. Vein scanning could get this fear out and also enable more users to wear smart watches. Since this news is based on a leak, the pictures however looks authentic. It will be interesting to see how Samsung would go forward with this kind of smartwatch!